This post demonstrates in a nutshell the fundamental problem with all anti-gun arguments: they are not based upon reality. The poster you have copied lists weapons from the video game Modern Warfare 2, see: http://www.modernwarfare247.com/weapons/. While these video game guns seem scary, just like the imaginary villains they were designed to slay, most are neither legal for civilians in the United States nor automatic in real life. As a threshold matter, this list of “scary” guns includes: a bolt action rife (the Intervention), a double barreled shotgun (Ranger), a pump action Shotgun (Spas) and a revolver (.44 magnum). Mechanically none of these could ever possibly be “automatic,” since they all require manual reloading. The following guns have always been manufactured or imported in the United States in semi-automatic varieties only: WA2000, Barrett .50, SVD Druganov, Desert Eagle, USP, M9. Legally, most of the remaining guns could not be automatic in the United States. Contrary to disinformation spread by the Brady Center, “automatic” weapons i.e. machine guns are prohibited if not registered by May 1986. See 19 U.S.C. 922(0). Accordingly, civilian ownership of the weapons developed after 1986 is absolutely prohibited, this includes the: ACR, Glock 18, SCAR, Tavor, F2000, UMP, Vector, P90, PP2000, TMP, AA-12. Additionally, the Gun Control Act of 1968 prohibited the importation of foreign machine guns, this eliminates all the foreign automatic guns designed after 1968 including the: FAMAS, L86, M240 and M93 Raffica. While there are some guns on this list which are both automatic and legal, they were all registered prior to 1986 and extremely rare and expensive. Legal machine guns of the types pictured would all cost well over $10,000.00 (except for possibly the UZI) and involve several months of federal paperwork. The WA 2000, is not even automatic and still retails for $75,000.00. Legally owned machine guns are so rare, that I will give you or your research assistant $100.00 if you can show me one conviction of a civilian (i.e. non police or military) that used their legally owned machine gun to kill someone since the National Firearms Act regulating automatic weapons was instituted in 1934. The poster has some issues., but you are getting lost in the minutia and missing the point. The idea is that there is something wrong with this country when we can get even a pump action shot gun or a .44 cal revolver legally, but can’t get delicious french cheese. 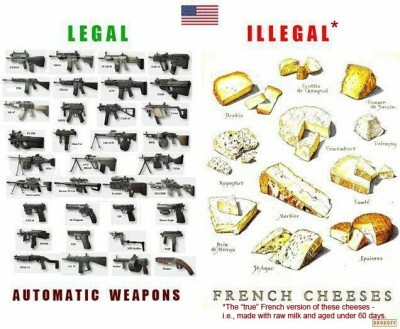 This is more so the case when the French cheese is banned for safety reasons. Don’t you see the irony there? If your point is that French cheeses, (And let’s add German sausages!) should be legal to import, I’m with you. But there certainly is an issue here, in that gun control propaganda routinely gets basic facts wrong. Knowingly wrong, to make for better propaganda. I think the term here is “lie”. btw…its not that tough to get a weapon with serious destructive power. You can, for example, legally get (or at least could just a 5 or 6 years ago) a semi-automatic AK-47 with a 100 round clip. A few years ago I went up to Indiana to visit a friend. He had, and probably still has for all I know, a small collection of firearms including just such a weapon. We went to the local outdoor shooting range. It was a rural range and no one else was there, so the range operator didn’t object when I decided to unload the whole 100 rounds as fast as I could. It took under 2 minutes. Let me tell you, if I can do that legally, I should be able to choose my own cheese. LOL. Patrick, your only mistake is thinking that the anti-gun folks CARE what you think and that a reasoned argument can sway them. The kind of people who honestly don’t see why the right to gun ownership is fundamental to American society (literally and morally) are the kind of people incapable of understanding why.